testing image for purposes of website construction, so I'll keep on writing and see what happens if it is a really long description, like this one. This exhibition rediscovers the life and work of one of New Zealand's most talented and original artists. ‘The Imaginative Life and Times of Graham Percy’ rediscovers the life and work of one of New Zealand’s most talented and original artists. 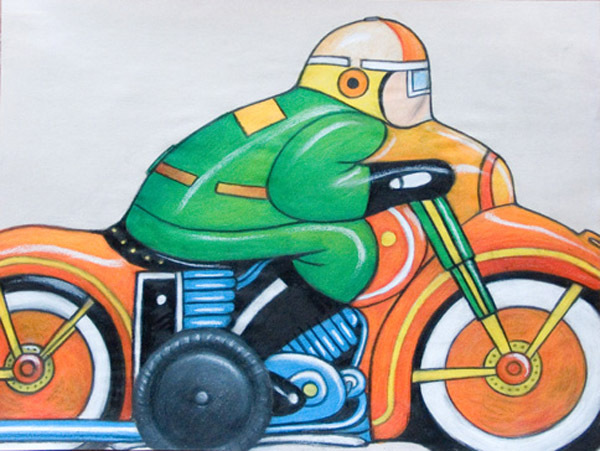 Percy left this country in the mid-1960s and became a hugely respected artist/illustrator/typographer overseas, while at the same time producing a remarkable body of his own independent art. This exhibition, and the major publication that accompanies it, celebrates Percy’s achievement as a published illustrator as well as bringing to light a significant body of work never seen before. His works are held in the collection of the National Galleries of Scotland, yet-since his early years in Auckland–they have never been exhibited publicly in New Zealand. Born in Stratford in 1938, Graham Percy studied at Elam School of Fine Arts before embarking on a career as an illustrator/designer/artist. A contemporary of Greer Twiss, Don Binney, Mervyn Williams and Hamish Keith, Percy was taught by Robert Ellis, Michael Nicholson and Colin McCahon (for whom he subsequently designed a number of exhibition invitations). Percy was a pivotal figure in the design and illustration of the New Zealand School Journal in the early 1960s, before transplanting to London, where he illustrated over 100 books. His art appeared in John Berger’s groundbreaking television series and book, Ways of Seeing (1972). 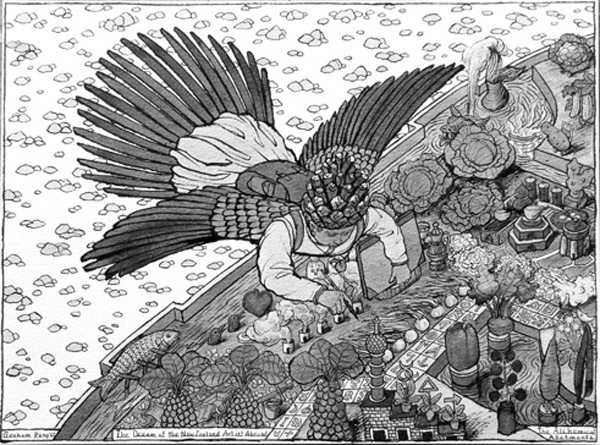 In 1994, Chronicle Books (San Francisco) published a book of his drawings (for an adult readership), Arthouse. 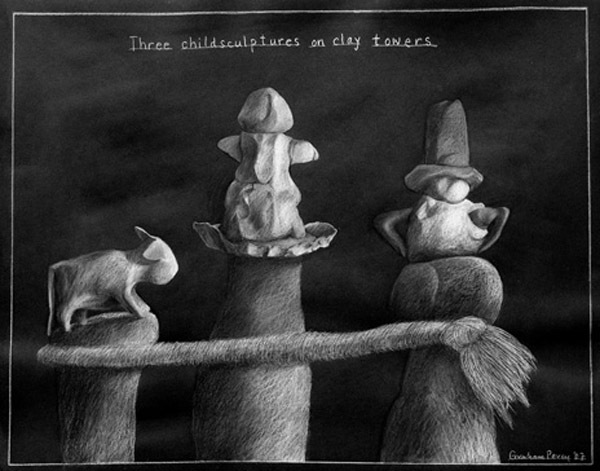 In 2007, a recent series of his drawings, ‘Imagined Histories’ was published in the United Kingdom. In recent years, the art of Graham Percy has featured in a number of New Zealand publications, notably Cover Up -the art of the book cover in New Zealand, by Hamish Thompson (Random House 2007), which included his well-known covers for such iconic books as The End of the Golden Weather and The Pohutukawa Tree. 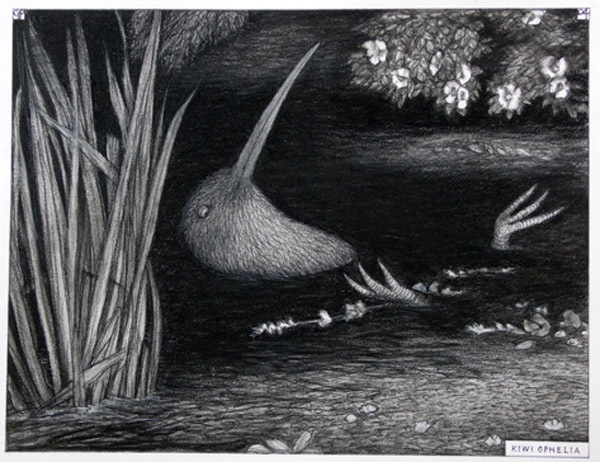 Percy’s art is a major presence in A Nest of Singing Birds; 100 Years of the New Zealand School Journal, by Gregory O’Brien (Learning Media, 2007) and his art also featured in O’Brien’s Back and Beyond-New Zealand Painting for the Young and Curious (Auckland University Press, 2008). Graham Percy died in January 2008. This exhibition and book project has been developed in close association with the artist’s family: his widow Mari Mahr, and his children Martin, Kitty and Yuli. The main visual focus of the exhibition will be a series of around 60 large and medium scale drawings. These will include a suite of anthropomorphised kiwis, travelling around the world and through time-a marvellously inventive, anarchic exploration of the national psyche. There will be drawings from ‘Imagined Histories’, a series of bucolic scenarios involving famous composers. (Numerous of these images also reference New Zealand-either faintly echoed or directly evoked). Virtuosic drawings from earlier in Percy’s career will convey a sense of both his remarkable technical prowess as well as his boundless imagination. The large-scale works on paper are particularly strong dynamic productions, in colour or in black and white. The Imaginative Life and Times will feature some of Percy’s most remarkable book designs, his typographic work (he majored in typography and graphic design at the Royal College of Arts in the 1960s) and his illustrative work for the New Zealand School Journal and for School Bulletins-many of which visitors (of a certain age) to the exhibition will recall vividly. Copies of New Zealand School Journals and School Bulletins designed and illustrated by Graham Percy. Percy’s early book designs and also his typographical invitations produced for Colin McCahon and for Auckland Art Gallery. Original artwork from some of his best-known children’s books: The Fantastic Flying Adventure by Gerald Durrell, Aesop’s Fables, the ‘Sam the Pig’ series by Alison Uttley and Jeremy Lloyd’s The Woodland Gospels. Stamp designs for Royal Post, billboard designs for London Underground, illustrations for the Times, Harper and Queens and other periodicals. Production drawings and colour backgrounds from the animated film ‘Hugo the Hippo’. Period photographs of Graham Percy from the 1960s until 2007. 1. The Hungarian animated film, Hugo the Hippo, which Percy art-directed in the early 1970s (see website link below). Auckland University Press will be publishing a book of Graham Percy’s art. The book will be c. 156pp, hardback (with dust-jacket). It will include around 120 reproductions (ie. all of the major pieces in the exhibition, as well as supplementary works). The book will be an artwork in itself rather than an orthodox ‘monographic’ publication. It will feature large-scale colour reproductions, photographs of the artist’s house (the ‘arthouse’ of the 1994 publication, in many respects), and a major account of Percy’s life and work. The book will be published by Auckland University Press to coincide with the opening of the exhibition at the Gus Fisher Gallery in May 2011. The exhibition and book will reach a wide public-an audience, I hope, as large as that reached by Back and Beyond-New Zealand Painting for the Young and Curious and A Nest of Singing Birds-both of which have been remarkably successful. The book will appeal to not only to art-lovers, design enthusiasts and the general bookish public, it will also be accessible to younger people: to primary, secondary and tertiary students. Like the work of all the great illustrators, Percy’s drawings communicate on many levels-they engage intellectually as well as emotionally. They can be playful and profound at the same time. Although Percy lived for the past forty years in London, his works are often gloriously (and refreshingly) New Zealand-centred. They are a singular playing out of the expatriate condition-they can be funny, touching, insightful, occasionally alarming, but always utterly engaging. The exhibition and publication will also be a paean to the art of drawing, to the exquisite beauty of the hand-drawn line, to the ink pen and the lead pencil. Many events could be held in conjunction with the exhibition. Learning Media (formerly School Publications) are enthusiastically behind both the book and exhibition proposal. Events relating to books and book-making, writing and illustrating for children etc could be held. Percy’s work with the School Journal would be an ideal focus for an event. Percy’s old friends and colleagues include Hamish Keith, Wystan Curnow and Greer Twiss. Floor talks, or a possible seminar, could be held alongside the exhibition. Children’s authors and illustrators (many of whom admire Percy’s work) could offer perspectives. gentle and subtly understated to the satirical and the wickedly witty. a uniquely talented and successful compatriot. 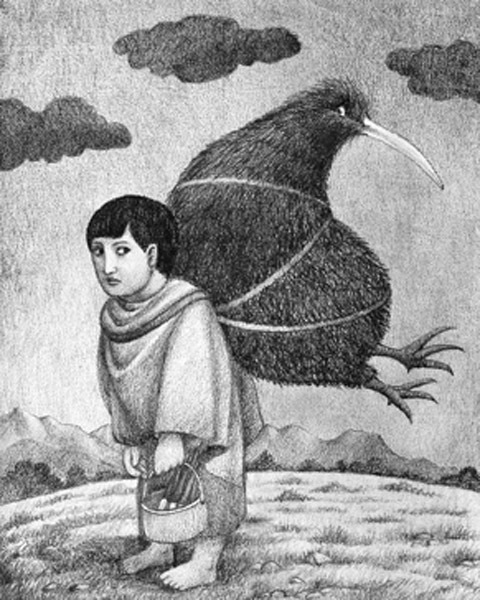 Graham Percy was one of the finest book illustrators New Zealand has produced. 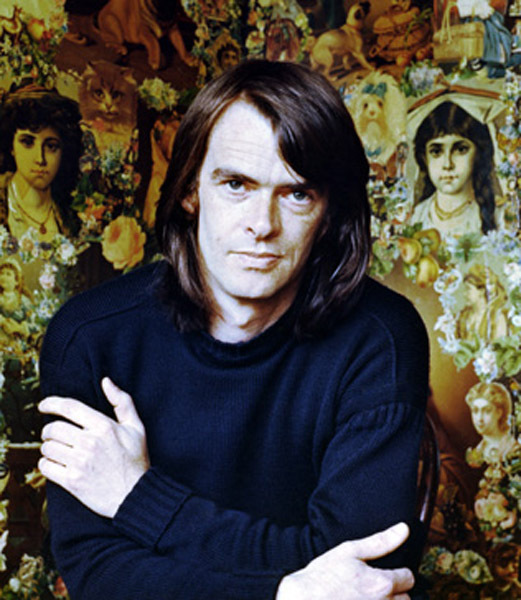 The circumstances of his talent obliged him to leave New Zealand in 1967 and shift to the UK where he flourished. Sadly his work is not as well know in his home country as it deserves to be, but he never grew far from or denied his New Zealand roots. Even in his last works he was exploring ideas only a New Zealander could explore. A comprehensive exhibition of is work is long overdue. enlighten a wide audience, of all ages and backgrounds. Hotere-Out the Black Window for City Gallery Wellington, 1997. From the BNZ Art Collection for City Gallery Wellington, 1998. McCahon -A view from the Ureweras for City Gallery Wellington, 1999. Parihaka -the art of Passive Resistance (with Te Miringa Hohaia and Lara Strongman) for City Gallery Wellington. John Drawbridge -Wide Open Interior for City Gallery Wellington, 2001. Peter Black -Real Fiction for City Gallery Wellington, 2002. Rosalie Gascoigne for City Gallery Wellington, 2004. Main Trunk Lines -New Zealand Poetry for National Library Gallery, Wellington, 2005 (co-curated with Jenny Bornholdt). Melvin Day -Continuum for City Gallery Wellington, 2005. Jane Pountney -wade in the water for City Gallery Wellington 2005. Noel McKenna -Sheltered Life for City Gallery Wellington. Elizabeth Thomson -My Hi-Fi My Sci-Fi for City Gallery Wellington, 2006. A Nest of Singing Birds -100 Years of the New Zealand School Journal for National Library Gallery, Wellington, 2007. Aberhart for City Gallery Wellington, 2007. Fiona Hall-Force Field for Museum of Contemporary Art, Sydney, and City Gallery Wellington. John Pule (co-curated with Aaron Lister) for City Gallery Wellington, opening June this year. Exhibition developed and curated by Gregory O’Brien in partnership with Exhibition Services Ltd. Assisted by City Gallery Wellington. Publication available at wholesale price. RRP $45. 50 -60 running metres required (flexible). 4 sucure display cases for ephemera. Each approx 120 x 80cm.